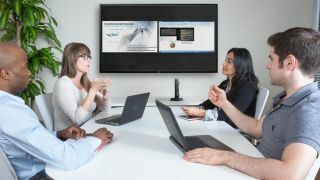 HP unveiled a suite of conference room products to make it easier for attendees to collaborate, video chat, share and stay productive while keeping their data safe. The products range from a new video conferencing monitor, Chromebox, PC and keyboard. "Too much time is spent at the beginning of a meeting getting the technology to work," HP said in a statement. "Collaboration solutions from HP help address these challenges by providing a simplified experience to engage with colleagues." The Collaboration PC ($719, £468, AU$937) is based on HP's EliteDesk 800, a small desktop computer that competes with Apple's Mac Mini. Featuring Intel Core i3, i5 or i7 processors with vPro and the latest Intel Unite technology unveiled at Computex 2015, the HP Collaboration PC allows users to safely log into meetings with secure, rotating PIN codes, protected data so sharing stays within the network and seamless collaboration with wireless screen sharing. As wireless sharing is a standard feature, HP claims that wires and dongles are no longer required. The device is compact and can be stowed away out of sight in a conference room or be used on a desk as it occupies little space. Also featuring Intel's processor, HP's enterprise-grade Chromebox for Meetings ($999, £650, AU$1,301) is designed to simplify video calls and is designed to work with Google Apps for Work if your business relies on Google services. "Easy to set up and simple to use, the system allows conference participants to access meetings from most PCs, phones or tablets to share screens, draw, annotate and edit documents in real time with Google Apps for Work," said HP. The system is compatible with a number of unified communications and video conferencing systems. HP bundles this Chromebox with an HD webcam, speaker and microphone. A remote control allows users to join a hangout with a simple button press. Priced under $200 (£130, AU$260), the 21.5-inch ProDisplay P222c Video Conferencing Monitor is Skype for Business-certified. It comes with a webcam and microphone for audio and video calls. Call controls are integrated into the display bezel for quick access. There is also an HP Conferencing Keyboard that is optimized for Skype for Business with dedicated control keys. The keyboard is priced at $99 (£65, AU$129).